We always can find lots of blogs and articles about the latest hair trends for women, but men count too! At TRU Salon + Spa, we have a whole menu of services designed to take care of the man in your life. With summer just around the corner, we’ve put together some of the best buzz cuts trending for 2018 to keep your man looking and feeling cool this summer. If you’re not quite ready to go military short, this buzz cut is just a little longer. It promises a neat, clean look for the summer without taking the plunge of a military length buzz. Fades have been around forever and they won’t be going away anytime soon. A fade has almost no hair along the sides and back of the head with hair on top of the head. It’s close to a taper cut, however, a taper goes from thick to thin much more gradually whereas a fade is more aggressive. The great thing about this cut is that it looks good with any thickness of hair. This makes it a popular look. Your stylist will shave a hard line on both sides of your head. You choose the length, or even a design added to the fade, adding to the versatility of the hairstyle. Think Tom Hardy in Taboo .... very edgy, daring cut that also includes a high skin fade. This look gives the appearance of the hair on top looking longer and adding an overall texture to your hair. Typically, you’ll see a “cat scratch” on the side towards the back that completes the overall look. We have found this called a line up, edge up, or shape up cut. It creates a sharp, clean hairline that frames your face. A straight line is shaved across your forehead and around the temples. 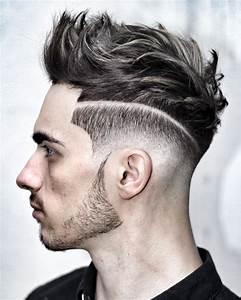 This technique can be added to a buzz cut, fade, or a wavy style with these sharp lines adding more definition to a strong jawline. No matter what style you decide to show off for the summer, TRU Salon + Spa can help! Give us a call at one of our two locations - Branchburg, NJ (908) 218-9878 or Warren, NJ (908) 753-9878, book online. Want to make an appointment at your convenience? You can download the app for free from iTunes, Google Play, or Amazon.